It’s been a while since I’ve been able to speak at a user group meeting. I think the last time was December of 2010. While that doesn’t sound like a long time, it was nearly 6 months ago! I am attempting to make up for it next month with two DotNetNuke user group meetings in June. A user group is simply a way for people that are interested in a specific topic to get together to learn something new. However, the most powerful thing about user groups is not the topic or content – it’s the long-lasting and valuable personal and business relationships that result from the meetings. User Group meetings come in many shapes and sizes. No matter the group, get involved. You won’t regret it! You’ve undoubtedly heard some of the buzz being generated by the version 6 release of DotNetNuke. There’s been waves of buzz coming out about it since the DNN Connections conference last November. Shaun Walker outlined quite a few things that are a focus of DNN Corp to get into the core of all editions of DotNetNuke. This upcoming release is delivering on that promise in a huge way! If you’re at one of the user group meetings below, you will be one of the first people in the entire world to see DNN version 6 in action!!! My first user group visit in June will be at the ODUG. If you’ve been reading my blog for any length of time, I think it’s pretty clear why. That’s where it all started for me (kind of). My next trip will be to Dallas. 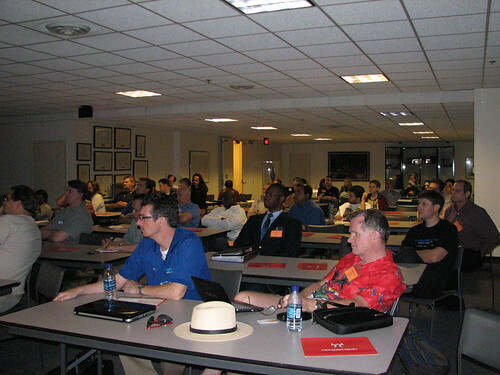 The Dallas user group is one of the more active DNN user groups in the United States. I haven’t met too many people in the Dallas area, but I hope to meet everyone from the Dallas DotNetNuke user group. All that’s left now is for you to show up… What’s to lose? You get to show up, see some cool stuff, meet fun people, hang out, trade business cards, get free pizza… I am not seeing any downside here!